In mid-June 1993 we stayed in a farmhouse in a small village called Longueville-sur-Scie, about 30km south of Dieppe. This is a very quiet and rural farming area. We birded in three main areas: the village, an area of lakes nearby, and at a reserve on the north coast. 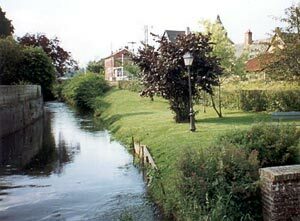 The river Scie flows through the village and watching from the bridge over the river proved to be best for birds. We commonly saw Black Redstart and Grey Wagtail here. Barn Swallows, Common Swifts and House Martins were common here and twice we had Eurasian Hobby flying over. Walking the few hundred metres between the farmhouse and the village added Great Spotted and Green Woodpeckers, Goldcrest and Common Chiffchaff. Around the farmhouse we saw Short-toed Treecreeper and Garden Warbler.